I was watching television recently and this Canada Dry commercial really got my attention. I had no idea that Canada Dry soda came right from Jack’s Ginger Farm! Canada Dry’s website tells me that they use “real ginger” and suggests five easy ways to go organic, so real ingredients must be important to them. I decided to read on and check out the FAQ page. “Q:Why isn’t real ginger listed on the ingredient panel? A:Real ginger is part of the natural flavors in the ingredient list. Flavors are grouped together in the ingredient line under the umbrella of “Natural Flavors” to protect Canada Dry’s proprietary formula. Q:How much real ginger is in Canada Dry Ginger Ale? Let me see if I have this straight. Canada Dry soda has real ginger in it, along with other “natural flavors,” but we can’t know how much ginger or what other “natural flavors” are in it. Interesting. This was even better! Farmers working together to make my frozen dinner! Only Stouffer’s had even less information on their website about this new line of products. No information on the farms sourcing the ingredients, or even what the ingredients are in the meals. The only thing I could glean from the website is that these are my “favorite Stouffer’s meals, now featuring ingredients like olive oil, sea salt or whole grains, and no preservatives.” What happened to the dairy farmer and the pepper farmer from the commercial? Where are those ingredients coming from? Do you remember seeing McDonald’s From Here campaign last year? The From Here website showcases ingredients (potatoes, fish, apples, and milk) that are used in McDonald’s menu items, and provides a downloadable fact sheet (PDF) for additional information. I learned that “almost one of every three McDonald’s french fries is made from Washington potatoes. What’s more, within Washington state itself that number is closer to 95 of every 100 fries.” But what are they really telling me? I still don’t know where or how the potatoes are grown. I also learned from a press release (PDF) for the campaign that “…virtually all milk served at McDonald’s comes from Darigold®, a Northwest cooperative owned by over 500 dairy farmers from Lynden to Chehalis to Spokane.” So now I have a name for a source, but I still don’t know anything about the cooperative, how the cows are raised or what their practices are. The press release boasts, “McDonald’s is taking the bold step to provide more transparency on how its 191 Western Washington restaurants are able to both source and serve the great-tasting, quality food their customers expect.” Is that really what food transparency is all about? They’ve even set up a special website, Behind the Pizza, to help customers “learn the truth.” Oddly enough though, I couldn’t find a way to get to the Behind the Pizza site from the main Domino’s Pizza website, so you have to already know about the site to have any shot of finding out where your food is coming from. Behind the Pizza is set up as a game, rather than solely an informational site. This makes it more challenging to navigate and time-consuming to find out information about the food. As you navigate through the game, at time Domino’s provides a video and a name of one of their farm suppliers for certain ingredients, like for tomatoes, mushrooms, and spinach. At other times though hardly any information is provided at all – this screenshot provides information on the source of their pepperoni. Great. So that tells me….nothing. Can any major company tell me more about where my food is coming from? Lay’s Potato Chips is also working to tell you where your food is coming from. Their website has a Chip Tracker that helps you figure out where your bag of potato chips was produced. You can also zoom into individual states and get the names of farms where the potatoes are grown. 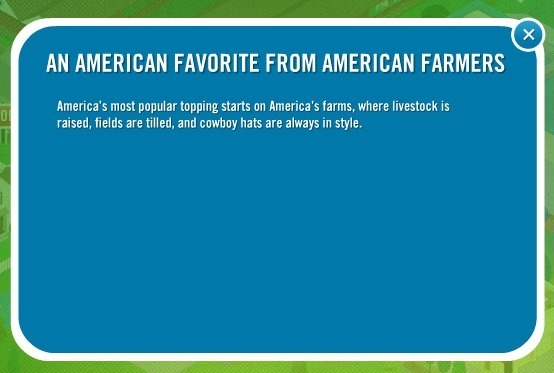 There still isn’t any information on the farms or their growing practices (other than the commercials, like the one below), but at least all of the farms are named, so it is possible to try to research them further. Although these examples are disappointing and far from perfect, I think they’re also examples of the direction that the food movement is headed. People want to know more about their food. Superficial coverage of food sourcing in advertising might make some people feel better about what they are eating, but it won’t satisfy everyone. As cliché as it sounds, we’re all going to have to keep working together to improve food transparency. Take the time to challenge companies to do more, support movement’s like Jamie Oliver’s Food Revolution, and educate yourself by talking to a farmer about their growing practices during your next trip to the farmers market. This entry was posted in Food Transparency (the issues) and tagged advertising, canada dry, domino's, food transparency, lay's, lindsay jean hard, Real Time Farms, stouffer's. Bookmark the permalink. Great post. I like that you ended it on a positive note despite the obvious frustrations with these companies and their games. Thanks Ryan! It does seem like the demand is increasing, so I’m hoping that companies become more and more transparent. Did you happen to see Monsanto ads? Earlier in the year there were many images of a American farmer on Monsanto ads. Yes, the big M all about farmers, sure. Selling seeds that cannot be saved, monitoring and policing the terms of the contract, and most importantly, selling products (seeds & herbicides like Round Up) that have not be tested thoroughly or properly (bad for us, bad for the environment, bad for animals, bad for the farmer, as Dr. Don Huber recently pointed out). And despite all evidence to the contrary, the big M tries to expropriate sustainability to itself–superweeds, pesticides, monocultures included. Yes! There were SO many ads to choose from, I had trouble deciding! The “corn sugar” ads and recent Wendy’s ads were in the running too…. I couldn’t agree more…and it even goes further with MSG being labeled as “sodium” or “spice”. What about the fungicides that get left on the fruit when juice is made? They don’t show up on the ingredients list either. How can we have faith in any ingredients list? How can we trust them? We couldn’t agree more! The best we can do is try and keep buying from sources we know and trust – which is what we hope to keep helping to do!